What if your coffee maker can also do a lot of things? We are talking about making a frappuccino, mixing lemonade, or even rinsing quinoa for your salad. That sounds impossible and even weird, but this is the concept that the Kitchen Supreme French Press is trying to sell to us. Come to think of it, as quirky as it sounds, it is not a bad idea. When you have a tool that does it all, it makes the purchase worthwhile, right? The question is does it work? That is what we are going to find out in today’s read. We are going to learn if the Kitchen Supreme French Press can really do all those things. At the same time, we are going to determine if it can, at most, brew good quality coffee. Accordingly, we are going to take a look at its features as well as the pros and cons of using it. Lastly, we are going to compare it to a similar product to see how it fares against its biggest competitor. Are you on the lookout for a multipurpose coffee maker? Then keep on reading because this product might just be the French press that you are looking for! This specific release comes with a new design, which is a combination of minimalistic chic, the classic look of a French press, combined with a modern look for the handle and the base. It can also brew at least eight small cups of coffee or four coffee mugs. The whole set comes with the French press itself, a spoon that is made of stainless steel, four filter screens, a scoop for coffee or tea, and a book containing recipes of baristas. It also has a five-year warranty. 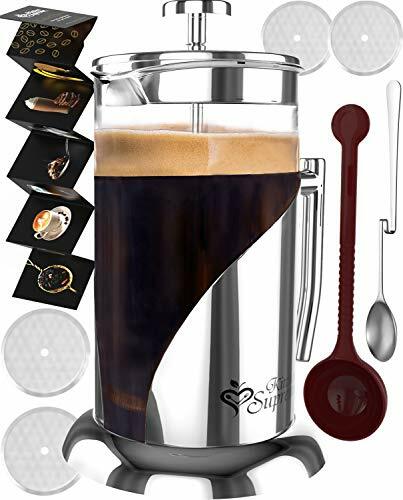 Additionally, they claim that it is the only French press with a double encapsulated lid that is made of stainless steel and is also plastic-free. As for the carafe, it has something that they call as “unbreakable glass” since it is made of thermal, borosilicate, and shock-resistant glass. When it comes to the filters screens, they are made to be compatible with all types of coffee grounds and can be used for tea infusion. The four-filter system is the key behind the versatility of this product. With the help of the book that comes with your purchase, you use the filters in order to have a velvety, foamy, pure, or creamy coffee or tea. At the same time, it has instructions on how to use the French press on various kitchen processes such as rinsing vegetables and plant tinctures. The filtration system helps with the taste of the final brew. The lid gets wobbly while pressing the plunger. The lid has a gap where the heat can escape. The handle is not attached to the carafe which can then slide out to the top. The press does not go all the way to the bottom. The Kitchen Supreme French Press might look like any other classic French press, but it is far from that. Its minimalistic design hides a secret, and that secret is the versatility of this product. You cannot only use it for brewing coffee, but you can also make a lot of hot and even cold beverages with it. Additionally, it has an excellent filtration system that you need not worry about even the finest of coffee grounds. A coffee brewing newbie can easily master this French press and coffee connoisseurs can also appreciate this. 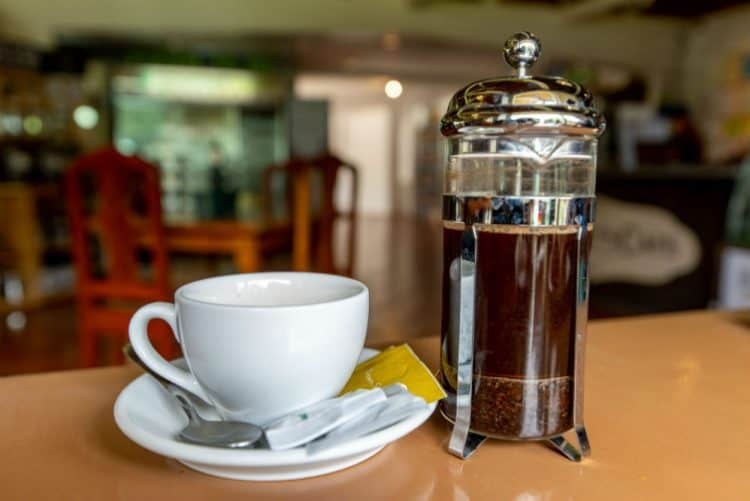 In short, it is a good, middle-ground French press that can help you brew a flavorful yet smooth coffee. Let us now talk about the biggest competitor of the Kitchen Supreme French Press, and that is the Bean Envy French Press. It is its biggest competitor because its main selling point is also the versatility of its design. As far as the accessories that come with the French press, it is not as numerous as that from the one from Kitchen Supreme. In fact, the accessory that comes with the Bean Envy press is a milk frother. However, this milk frother can also prove to be more useful than the accessories that came with the Kitchen Supreme French Press. This is the case as an actual milk frother can also make cappuccinos, frappuccinos, and even milk teas. In comparison, the mixing tool that the Kitchen Supreme French Press has will require a lot of effort from the user to achieve a good froth. In short, it is more convenient to use a milk frother. Could this be the downfall of the Kitchen Supreme Press? As for its filtration system, it has a simple one unlike the four levels of the Kitchen Supreme, so expect to have a few stray coffee grounds in your coffee. Also, some parts of the French press are made of plastic that may or may not affect the quality of your brew. This fact also raises a question about the overall durability of the product. It is, however, dishwasher safe or at least some of its parts. When compared to Kitchen Supreme, the Bean Envy is the winner in terms of convenience in cleaning. Taking everything into consideration, the winner is still the Kitchen Supreme French Press. We can also safely say that it is one of the most versatile coffee makers in the market. With that said, it is not a perfect French press since it does have some design flaws that can somehow irritate the user. You really have to do some of the dirty work in order to make it clean and to finally enjoy your cup of coffee, but surely, this effort is worth it because once your coffee is brewed, you are assured that you get a great tasting one. Enjoy your latte, lemonade, and even salad with this French press!